Those of you that know me, understand that some projects I undertake can linger for a while. I’ll collect a bundle of materials for a project, and then trip over them for weeks before I get to them. Well, in this case, it hasn’t been weeks but years, lots of years. It started out with a colleague from work probably 15 years ago. He needed some lumber for a trailer bed, which I happened to have, and he had some bricks that I wanted. So we arranged a swap. It took me two loads in our van to haul them all home. I neatly stacked them in front of the garage, where they have stayed ever since. I’ve used the horizontal surface the top of the brick pile provided for many things over the years. 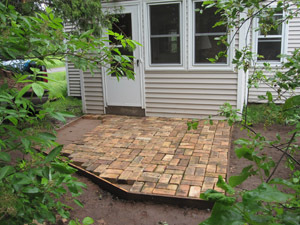 But I never quite got around to building the patio with them that I had intended to build… until this week. The first step was to hire my strong young neighbor. I’ve learned over the years that this technique is the best way to insure I’ll keep going with a project. 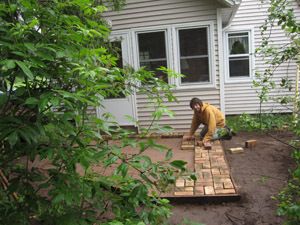 One of the impediments to this particular job is that it involved digging up the yard, and especially the area right in front of the door to the house we use multiple times each day. So once this project got started, it needed to be completed as soon as possible. This picture shows the step we’ve used to get into the house for about 15 years now. It also shows the gnarly piece of plywood I put down years ago in an attempt to keep the dirt out of the house. My idea was to put draintile all around the inside of this patio, so no water would linger there. Where we live, the danger times for this is spring when the snow is mostly gone but the nights are still freezing. If water is hanging around then, it expands and causes all manner of bulges in formerly smooth surfaces. So our first day involved digging down beside the house until we found the 4″ plastic pipe that removes the runoff from our eaves. Once we found that, we cut a hole in it and inserted another piece of pipe that would lead to the patio. 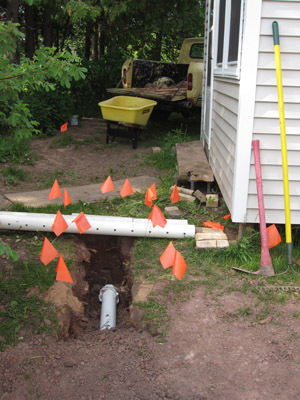 Then we dug a trench and placed 4″ pipe, elbows, and 45s until we had the pipe sitting just below where the patio was to go. Next we started digging in the area where the patio was to go. The sound you least like to hear is a thunk when you hit something hard, like a root. We had a lot of thunks, because we found a lot of roots. 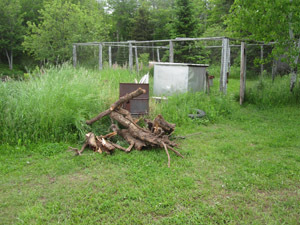 We had had a large tree taken down in this area a few years ago because it was leaning toward the house. The roots were dead, but were still hell bent on hanging onto the earth. We finally had to back the dozer up, hook the winch cable around the roots and pull them out that way. This picture shows some of the roots we had to dig out. Once we had things pretty well dug out around the perimeter of the patio, we installed some cedar 1x6s to make a frame for the patio. The thing was roughly 10′ x 10′, except for one truncated angle, which my artsy fartsy wife felt was needed (I eventually agreed with her.) With the frame in place, we were able to excavate to the rough depth. While digging was going on, I headed into town to pick up the gravel layer. I figured we’d need about a yard of gravel. I looked online, and learned that 1 yard of 1″ stone weighed about 2,700#, which is well within the acceptable range for my truck. So I drove into town and over to the cement/gravel plant in Hancock. I pulled onto the scale, walked inside, and told the clerk what I needed. He told me which pile to drive to, and radioed the loader driver. These loaders are big enough that one bucket load could just about bury my pickup. When he drove up, I told him I wanted about a yard. He scooped up a fraction of what his bucket could hold, and shook it onto the truck. 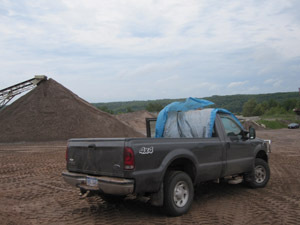 When I drove back to the scale to pay for my purchase, the net weight of gravel was 3,700#! I’ve never had that much on this truck, but I have to say it didn’t seem to notice any hardship on the way home. 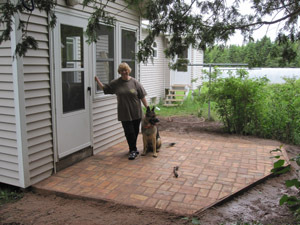 Once back home we shoveled gravel, set our tile, and shoveled more gravel. We used every scrap of gravel in that load, and it came out perfectly. 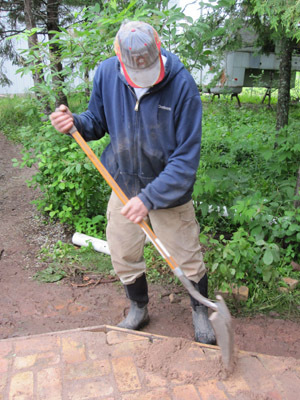 Next I headed back into town and got some masonry sand for the next layer; a 2″ layer on which the bricks would sit. I told the operator I wanted about 3,000# this time. He again grabbed some material, dumped it into my truck and drove off. When I checked out this time, the weight was 2,920#. He missed it by just 80#. That load was spread on top of the draintile and gravel. We fabricated a “screed” to more or less automatically give us the smooth depth we needed to have the brick sit level and at just the right height. We had everything screeded, tamped down, and ready to go. We did a check with the actual brick, and noticed the brick were sitting just a bit below the lip of the wooden forms. Doing some math, we decided to add an additional 1/4″ of sand to the inside of the forms. We were unfortunately out of sand, so I had to make another trip to town for some more. After a couple of more hours of messing around, we had the sand where we wanted it. Now came the fun part. We hauled the brick from the place they’ve been stacked for so long, and started putting them in place. After all the work it took us to get to this point (days and days) the actual laying of the brick only took a couple of hours. Except for the angle. For that part, I’d need to cut some brick, but that would come later. 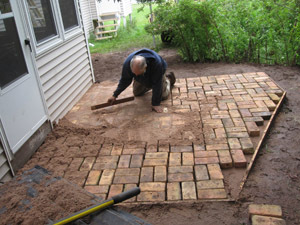 Once all the brick was in place, we took some leftover masonry sand and shoveled it onto the top of the bricks, and then used boards and trowels to coax the sand into the spaces between the bricks. This was a tedious and lengthy process. Once we got the whole thing mostly done, we got the garden hose out and watered it. This caused the sand to collapse into the cracks. We went through this procedure 3 times until we were sure that all the cracks had sand in them. Once that part was done, I dismissed my helper, and ran into town to the tool rental place, where I picked up their brick saw. This baby has a diamond blade and is designed to rip through brick. I got it home and quickly made the necessary cuts in order to finish out the brick. Next I shoveled on some more clean sand onto this section of the patio, watered it, and patted it until the sand had settled in as best as possible. At this point, the patio was now one complete solid structure. I swept the whole thing off with my shop broom, and called the family over for a picture. In putting this patio up at the height we did, we were able to eliminate the step we’ve had there for so many years. 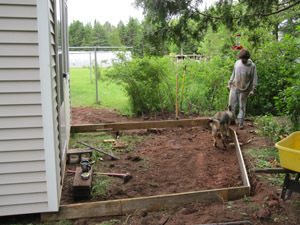 The step consisted of 2 cement blocks and a 2×12 spruce plank. In its place, you now step off onto a lovely new patio. This entry was posted on Thursday, June 23rd, 2011 at 9:11 pm and is filed under Uncategorized. You can follow any responses to this entry through the RSS 2.0 feed. You can leave a response, or trackback from your own site.